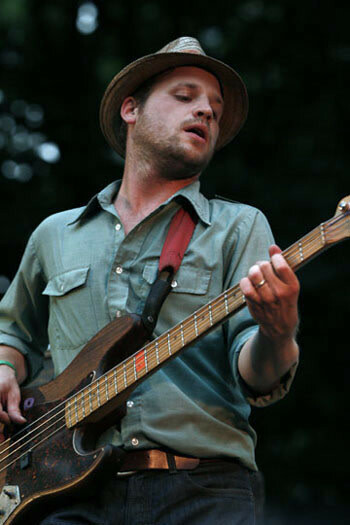 Bassist and lead singer Toby Leaman talks fans, fest, loyalty, apocalypse and hats. You might say Pickathon Roots Music Festival and the band Dr. Dog are “In a Relationship.” Fest founder Zale Schoenborn gushes about them and they return the love, clearing special space amid their packed summer schedule’s 20-odd festival gigs to hang out at Pendarvis Farm for all three days and perform multiple sets— including the closing show at the Galaxy Barn. We must say, Dog and Pick make a cute couple, both non-genre, long-running, slow-growing, highly skilled and effortlessly ethical. Artistic integrity, it would seem, is easy and fun. Sucking down a few of the cigarettes that must contribute to his husky Springsteen vocal tone while staring thoughtfully into the distance, Dog frontman and bassist Toby Leaman explained his band’s connection to fest and fans. Scott [McMicken, lead guitarist and co-lead-vocalist] and I have been playing together for 20 years; I can hardly believe it. That seems like forever. I always wrote songs, ever since I was 12 or 13, and when I met him, he was that kid who can do everything on the guitar…Hendrix licks, he could play anything. And I had no problem singing. My uncle was a jazz bass player, and pretty quickly I fell in love with the bass. We started by writing our own songs. We almost never played cover songs, and we never performed them. We started playing as a band about 10 years ago, and then about the last 8 we’ve been touring. This is our third year at Pickathon, and I still don’t know if [the organizers] brought us here initially because they were already big fans, or if they became fans after they saw us perform here. I see Pickathon as a festival for other musicians. There are so many bands here you wouldn’t hear of unless you came here, bands I would never know existed…and there’s not a dud in the bunch. Of all the festivals we play, this one definitely has the best lineup. [Pickathon bookers] do all the work finding great acts, and we’re the beneficiaries. Our crowd? It’s changing. We used to look out at the crowds and they’d all be guys who looked exactly like us [white, dressed-down, vaguely collegiate]. Now it’s gotten a lot younger in general, but there are also some old-heads in the mix—and it’s not just “dudes” anymore. But I certainly wouldn’t call it a hipster crowd, either. It’s not as though people who’ve only heard our single show up to hear us—because we’ve never had a single! I think the main pattern is it’s people who actually put a little work into figuring out what they like. A reaction to Gordon Gano’s Violent Femmes Pickathon set. Wow. Violent Femmes have been one of the most influential bands for me, for sure. I remember hearing them as a kid…"Never Tell" off of Hallowed Ground was one of the first covers I ever learned on the bass, and I remember just being so thrilled once I got it right. And Brian Ritchie really elevated the bass in that band. Believe Dog’s exuberant sound, not their doomsday lyrics. We write a lot of lyrics from the notion that there’s no hope left, and it’d be presumptuous to assume that everybody thought that way—but I think a lot of people kinda do. I don’t live that reality every day, but as a songwriter, you write to the ideas that pervade your brain. And the songwriting process is so solitary that it lends itself to solitary thoughts. People all like to have their idea that before their time there wasn’t anybody, and everybody wants the world to end in their time. They want to think they live in an important time, and be part of the ultimate corruption of the earth—but it’s not gonna happen. Still, the assumption that everything is temporal occupies a very real place in people’s thinking, and it’s a good place to come from. There’s no solid idea of existence. It isn’t there. People find a way to live within that every day. There’s such a fine line between what you consider to be your reality, and the reality you create. If you can step beyond that, it’s really healthy. Huh? Yeah, I mean I guess we wear a lot of hats. For a while we wore a lot of fedoras, which were a good way to show that we’re actually in a band, and not just a team of movers or something. But a hat is just good to have on the road. You get a hat, and you sweat right through it…or god forbid, it gets in the van and is completely demolished. But I think in general we’re a band that takes pride in not looking like a band.